A linebacker is a playing position in American football and Canadian football. 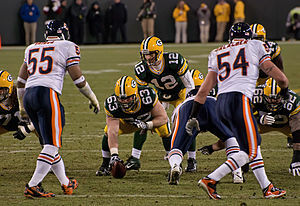 Linebackers are members of the defensive team, and line up approximately three to five yards behind the line of scrimmage, behind the defensive linemen, and therefore "back up the line." Linebackers generally align themselves before the ball is snapped by standing upright in a "two point stance" .